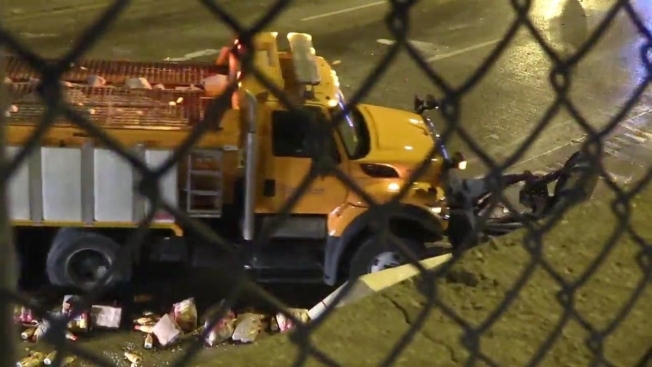 Inbound lanes of the Dan Ryan Expressway were temporarily closed to Chicago traffic Thursday night after a semi truck crashed and spilled its load of Coffee-mate. The semi and a silver Chevrolet vehicle crashed at 11:21 p.m. in the inbound lanes of I-90/94 near 59th Street, according to Illinois State Police. The occupants of the Chevrolet, three children and one adult, were all taken in serious-to-critical condition to Stroger Hospital, the Chicago Fire Department said. Police said none of the injuries were thought to be life-threatening. The semi spilled Coffee-mate onto the expressway, closing all lanes in the area until about 4:30 a.m. Friday, police said. Additional details, including whether citations or charges were filed in connection with the crash, were not immediately available.